What’s it gonna be: Real Justice Reform or Military Tribunals? The 9th District Federal Court, the Southern District of New York and the 11th Amendment has created two systems of Justice, neither of which are actually fair or just. If President Trump cannot successfully reform the U.S. Justice System, which has in many cases become rotten to the core, Military Tribunals may become inevitable. The 11th Amendment and its Sovereign Immunities Clause protects the U.S. Government which includes the Federal and State Governments and all of its agencies from being sued by its own citizens. That includes protection from being liable for payment of damages for tortious and even criminal acts committed by these entities against the people of the United States. However, an individual “Plaintiff” can sue an individual “Defendant” who works for or is a representative of a United States or a U.S. States governmental body. Unfortunately that “Plaintiff” will never win unless they have bottomless pockets and are willing to pay a bribe to the Judge who sits on a 9th District or Southern District of New York bench. Jurisdiction is controlled by the domicile of a defendant, therefore most Deep State Corporations or individuals, not known to be protected by the 11th Amendment, who can be sued for crimes against the people have a domicile or an agent for service of process in the 9th District or in the Southern District of New York. What makes the 9th District and the Southern District of New York jurisdictions different from the others is the compromised nature of Judges who preside over them. For instance, every City in the State of California, which is a State that sits within the 9th District, has been paying an under the table, annual bonus to their State Supreme Court Judges as well as many others up and down the State’s chain of jurisdictional control, without the consent or knowledge of the taxpayers of California for decades. Moreover, there is also ample evidence that the same thing is happening in the Southern District of New York. That gives true meaning to the lament that “You can’t fight City Hall.” Or even sue them. 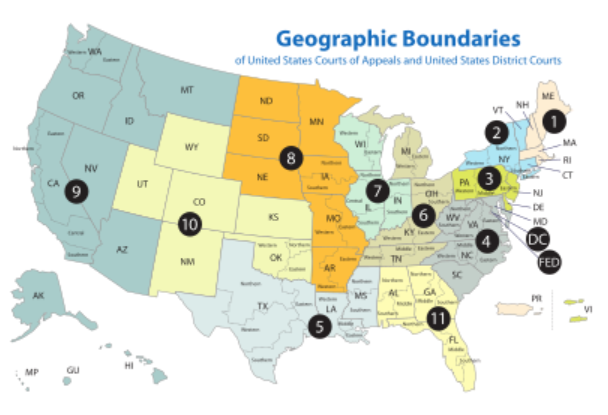 The 9th District is huge compared to the rest of the Supreme Court Districts and it encompasses so many Democrat Globalist-controlled States on the Left coast that it has helped to ruin the justice system of that part of the country. Furthermore, it makes trying to reform the election system that is so corrupt in California, by taking the cheaters to court, an almost impossible task. That’s why there are actually two Justice Systems. There is one justice system for the Big Banks, and CEOs, and big wigs of large monopolistic Corporations and for the Political Class; and then there is a different Justice System for the rest of us. The majority of the most monopolistic and well-known corporations in the United States are directly connected and funded by taxpayer money through agencies as well as through acts of the United States Federal Government and the governments of all 50 states. U.S. Congressional and State Representatives and heads of the incorporated agencies of the United States, which would include agencies like the Environmental Protection Agency, the Department of Energy, the Bureau of Land Management, as well as many of these Judges, are happy to buy up as much of the stock in those Corporations as they can since they control the fate of those Corporations anyway. Perhaps the most insidious aspect of this situation is that Judges and Attorneys and Politicians who are involved in keeping the U.S. borders open as well as in putting people in prison, own stock in the U.S. prison system. This corrupt system is also funded by taxpayer dollars, the rent payment required from, as well as the slave labor of its incarcerated residents. Moreover these so-called honorable investors also own lots of stock in Corporations that use prisoner’s slave labor under the auspices of the U.S. Prison System. As a result, the United States has more Americans and undocumented aliens incarcerated in U.S. prisons than any other country of the world, and it has for decades. Since people are led to believe that these corporations are independent manifestations of “the American dream” , they have no 11th Amendment sovereign immunity. However, they are still being protected by the Judges of the aforementioned Jurisdictions and others who have been “planted” in every Jurisdiction, from the head of the Supreme Court on down. What is not well understood by most is that the tentacles of Government control every aspect of our economy and our lives, especially when it comes to those who are allowed to succeed and those who are not. That is certainly not economic freedom, nor does it bode well for personal liberty. No one that is part of “The Powers That Be” seems to ever be successfully sued for their crimes against We the People because they all insist that their Jurisdictional Domicile falls within the purview of the 9th District or the Southern District of New York; or that they are protected by the 11th Amendment of the U.S. Constitution. Furthermore, if a citizen plaintiff sues a representative or employee of the government, because each Government entity is incorporated, the defendant cannot be sued personally for his own wealth but is protected under the corporate veil which then gives him or her the use of taxpayer money to defend him or herself and damages to the plaintiff are also paid via taxpayer’s largesse. Just like a corporate head would have the company’s money in order to defend him or herself from litigation for financial crimes allegedly committed against the shareholders of a Corporation, so does a government employee. Those individuals who are sued for their many crimes against the American people can use their positions of power and the corporate veil to hide behind. Whereas the “shareholders/ American people”, who as a class are the damaged party, have to pay for not only the cost of the litigation but for the damages as well. Our system is clearly one that, rather than serving the people, it is the citizens who pay the legal bills. Hence, the justice system only serves itself, and at a ever-growing expense year after year. Significantly, the majority of wealth that is being lost and funneled into the hands of the rich is “taxpayer’s wealth”, which is being funneled and laundered through governmental corruption, has enabled the truly rotten and compromised Judiciary. Therefore, no one but the Deep State gets justice in our rigged justice system. This is especially true of the 9th District and the Southern District of New York, where if the Deep State wants to punish an average citizen or someone like Roger Stone, — who they perceive to be getting in their way — they will find a way to change jurisdictions to the 9th District or the Southern District of New York. Then they will be able to indict, prosecute, fine and incarcerate even a ham sandwich without any evidence of wrongdoing … just so they can cover up their own crimes and maintain their corrupt and lucrative hegemony. A guilty defendant who represents any or all of the following: big politics, big government, big business, big banks, big monopolies, fake government entities like the IRS and the Federal Reserve, and Totalitarian Globalism, will not even be indicted. That’s why Robert Mueller has been using his Special Council powers to move cases that involve SPYgate to the Judges in the Southern District of New York and why it’s so very important for President Trump to continue his reform of the United States Judiciary.